Unconfirmed reports indicate that Bitmain—the Beijing based behemoth that manufactures and supplies the world with ASIC miners—will post huge losses for the third quarter mostly because of dropping digital asset prices and drop in mining gear demand. The company is yet to make their disclosure but we can only forecast what they are set to announce now that previous reports indicate that Bitmain owned more than one million BCHs and are yet to sell their rewards right after splitting off from the legacy chain back in August 2017. Seems like BITMAIN owns over a million BCH. I’m not a hater of Bitcoin Cash, it’s pretty cool, but to own that much of BCH, a cryptocurrency in which Craig Wright is a major influence on protocol matters? LOL! Add to this the hash war where a BitMex Research study said both camps used approximately $10 million to prevent an over-run and Bitmain might end up posting higher losses than the $730 million leaked. This is bad news for BCH and at spot prices, losses are step and look like miners are switching over to BCH SV—the only coin to post gains in the last week—in the process affecting the total network hash rate. According to data, the Bitcoin Cash network now has a hash rate of around 1.22 EH/s down from 7 EH/s it posted at the height of the hash rate war when they had to channel computing power from Bitcoin.com with further bolster from hash renting and from volunteering supporters. Statistics indicate that hash rate is down 11 percent in the last 24 hours alone. Prices are free falling and at current rates, BCH is down 16 percent and 38 percent in the last day and week. From candlestick arrangements and pace of decline, it is likely that BCH will test $100 or lower by year’s close. As it is, post-hard fork declines are devastating and as along as BCH/USD is trading below week ending Nov 25 low, we expect the drain and trend to be firmly bearish. Of interest is yesterday’s bear breakout bar driving prices below week ending Nov 25 lows of $150. Dec 5 bar had twice the daily averages volume of 31k against 18k further exposing dropping network activity—and increasing vulnerability. The gap down days after the Nov 15 hard fork did confirm the bear breakout of early August. Straight from candlestick arrangement to tapering activity, the trend is down and bears are in control as they trend within a bear breakout pattern. Thing is, the uncertainty about what the future of BCH holds is affecting prices. 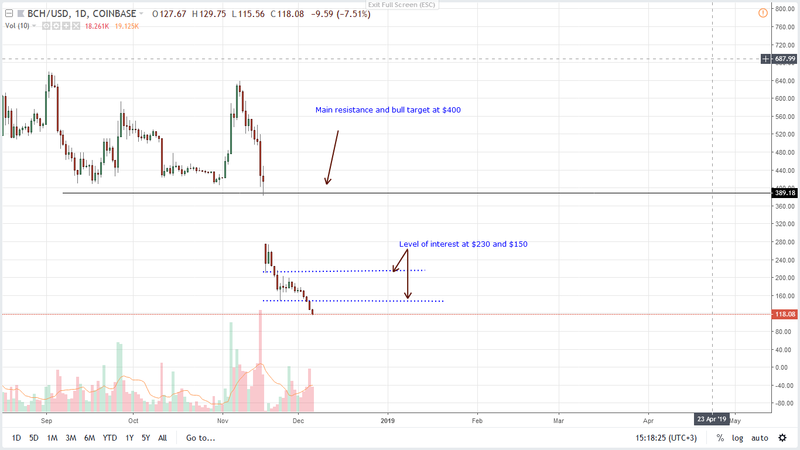 As long as BCH/USD is trading below week ending Nov 25 lows of $150 with support from increasing market participation—dumping—then it is likely that BCH will test $100 or lower in coming days. Of course, this will be disastrous for the network’s security as miners—businessmen searching for better deals–will switch to SV or the legacy chain where prices are better. This is not Investment Advice. Do you own Research.